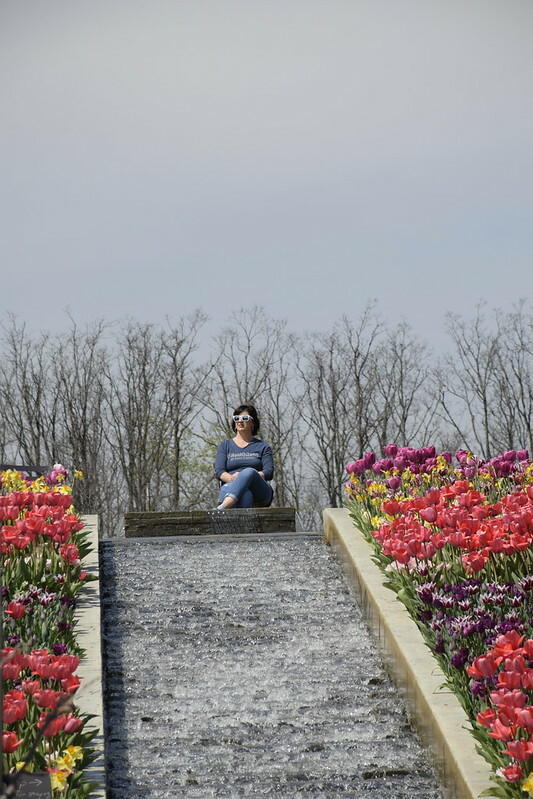 I took the day off Friday and wife Heather, and son Logan ventured out north of Tulsa to check out the flowers at the Tulsa Botanic Garden. 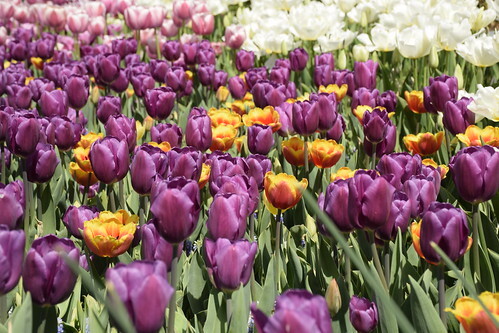 The Tulips are in bloom and are beautiful. 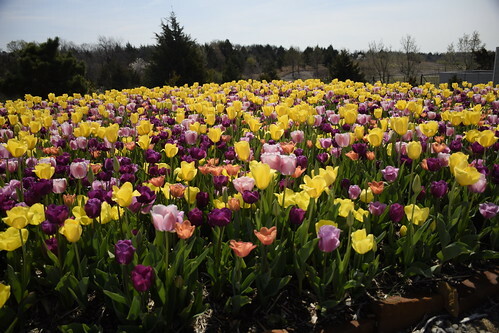 I think they planted something like 130,000 bulbs or something like that and they are dazzling especially in full sunlight. All sorts of colors and varieties. And here is wife Heather! She loves the flowers. And son Logan, he is okay with flowers and came along in anticipation of the ice cream to come later. And I captured Heather again. 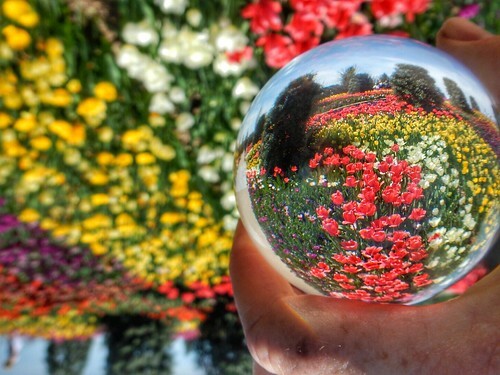 I snuck in my conjuring ball and took a few photos with it. You have to really be careful holding it, especially in the full sun because it flat burn a hole in your skin in seconds flat. So I have learned to hold it on the top. I flip most of the pics over anyway. It took me a while to learn how to get decent pics with it. I use a point and shoot in the macro mode and focus on the ball. You can use an SLR or a smart phone and I have but it is kind of clumsy, to me it is anyway. 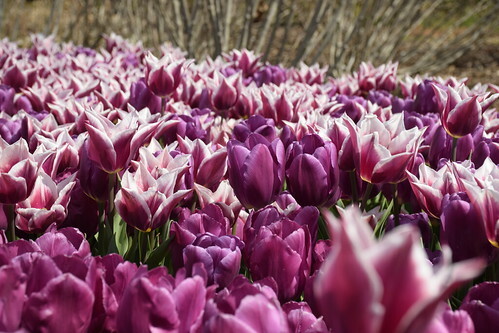 I never get tired of the tulips. The Garden has come a long ways over the years. I remember running trail races through the property years ago wondering when were they ever going to get some color out here. Will they have it in a big way now. We were out there because it was my birthday. This is my wife of many years, Heather. She spoils me shamelessly. Yep 64 years old as of Saturday. I like numbers and 64 is two to the 6th power. I don’t think I’ll make it to two to the seventh years, or 128. For some reason that doesn’t bother me. Ask me if I make it to 127 and I’ll probably be singing a different tune!! 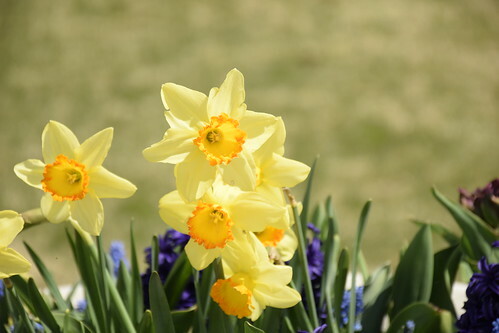 This entry was posted in Uncategorized and tagged Dafodils, Our World Tuesday on April 7, 2019 by Alan Bates. 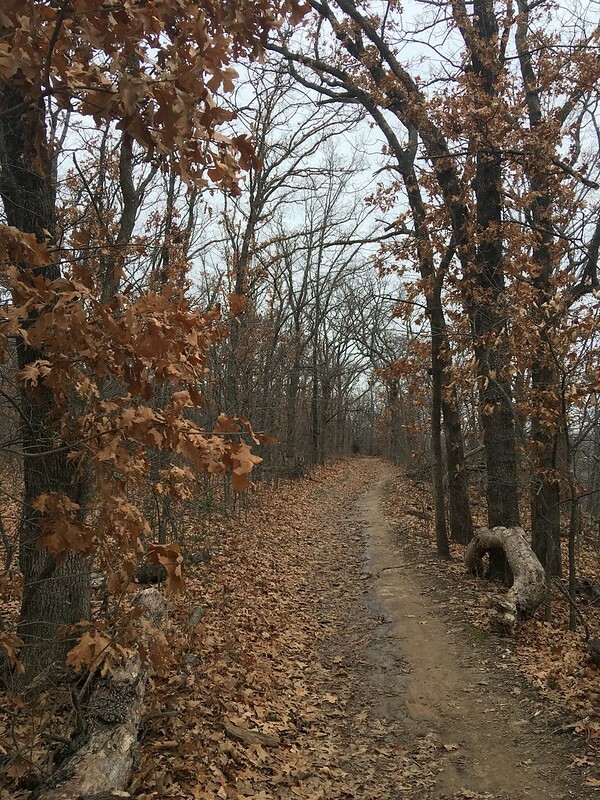 Saturday, I ran in the four mile event of the Greenleaf Trail Run at Oklahoma’s beautiful Greenleaf State Park. 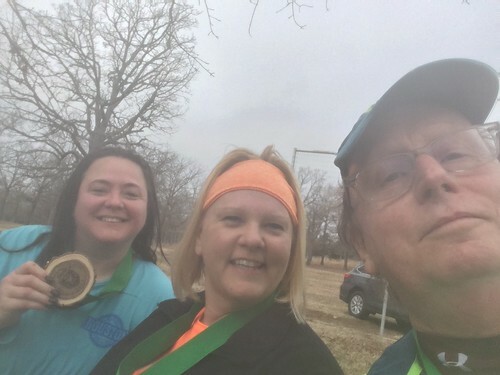 I say I ran, its more like I participated with my running friends Paula, left, and Melissa. We trotted a few hundred yards out of the four miles and the rest of the way speed walked it. There were three races, a twelve mile, eight mile, and ours and each started separately. Since these are trail races, there is almost always a traffic jam right away. Nobody worries about it much though. We ran through a bunch of great views including a segment out and back on a dam. The State Parks do a great job of keeping the brush down in the parks. The lack of thorns is especially appreciated. Melissa and Paula on the trail. I was wearing some brand new Hoka One’s that I bought over a year ago just before I had to quit running. 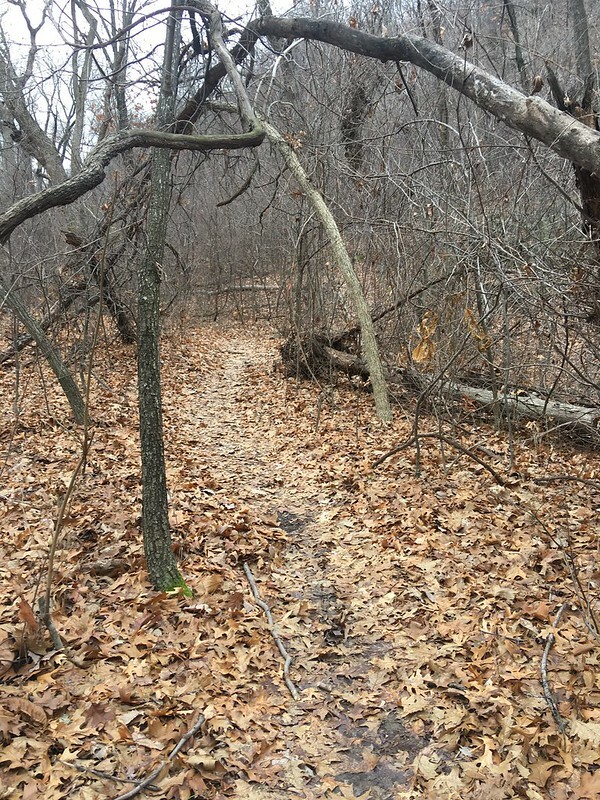 A lot of the trails were on side slopes, which is fine, but the Hokas were too high and put a lot of torque on my ankles. Plus they were not broken in yet. Warning ahead! 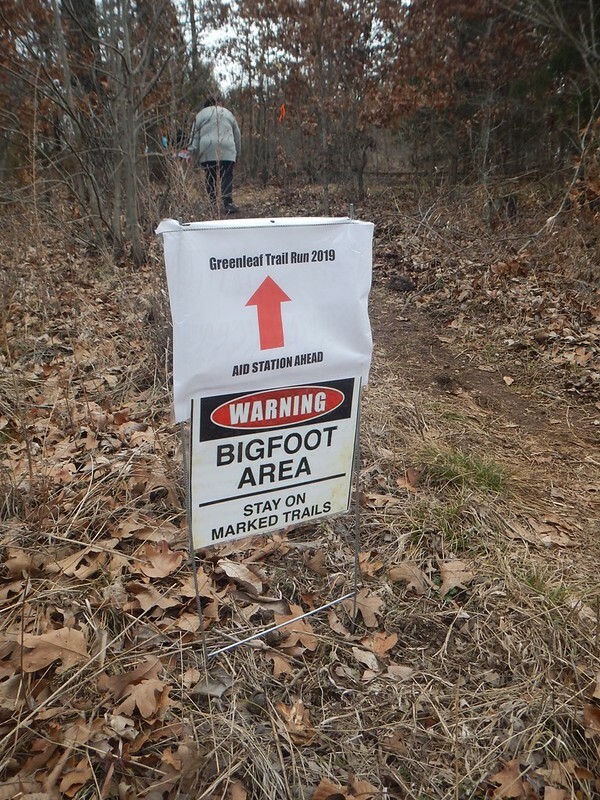 Bigfoot area. 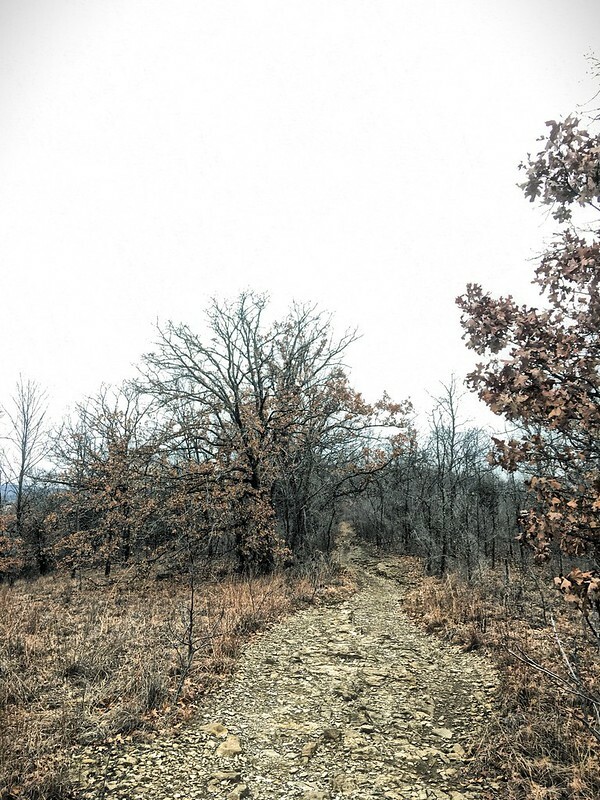 Eastern Oklahoma is a hot bed of Sasquatch sightings. And here is the critter himself. It was groundhog day. I didn’t see any groundhogs but Sasquatch couldn’t see his shadow, so does that mean we are having an early Spring? All three of us finished the race vertically so that was good. I thought the race was great. The course was beautiful, the package pickup was well organized. I love the cotton poly blend long sleeve tee shirt. They had cool coffee mugs at the end for everybody. They had great medals as well. You can see Melissa’s above. 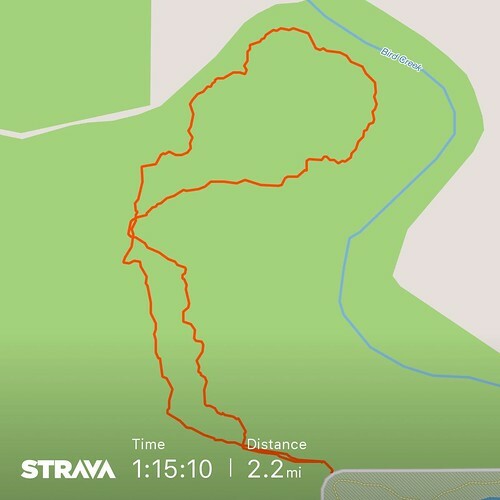 I went bushwhacking for a nearby geocache at the end of the run. I didn’t find the geocache but the medal fell off when I was out there. Anyway it was cool. I give this race five stars out of five. Thanks to the organizers and the army of volunteers who did everything from handing out packages, cooking and dishing out the food, marking the course, directing the runners during the race, and a myriad of other jobs. 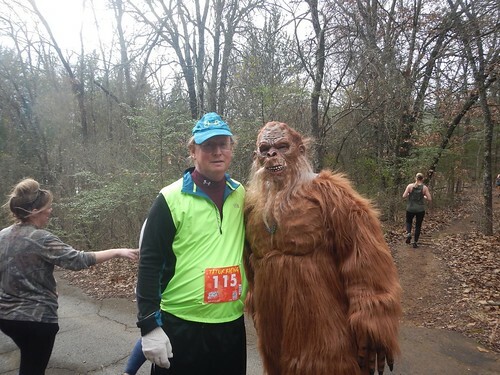 This entry was posted in Uncategorized and tagged Big Foot, Greenleaf Trail Run, Our World Tuesday, Trail Run on February 3, 2019 by Alan Bates. 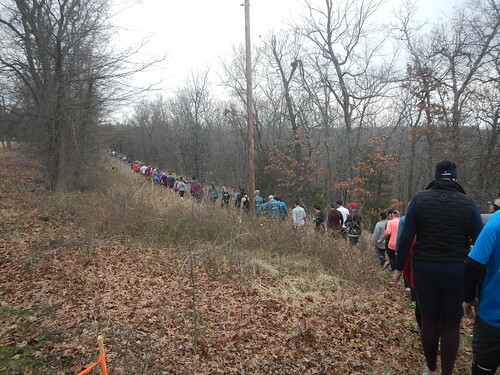 New Years Day I skipped the various organized runs and polar bear plunges and go on a facebook organized hike on Turkey Mountain but I had to change by plans when I was ten minutes late for the hike so I just went by myself. Which is fine, I like to go at my own pace and take photos and there were a couple of geocaches I wanted to try and find. 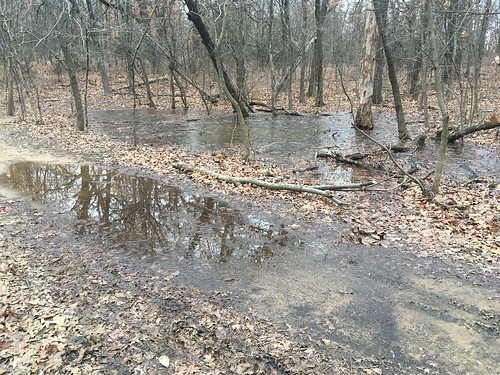 It was frigid as you can see from this surface skim ice on the wet part of the trail. It gets cold in Oklahoma but almost always a few days later it warms up pretty good. I stayed on the eastern side of the park. 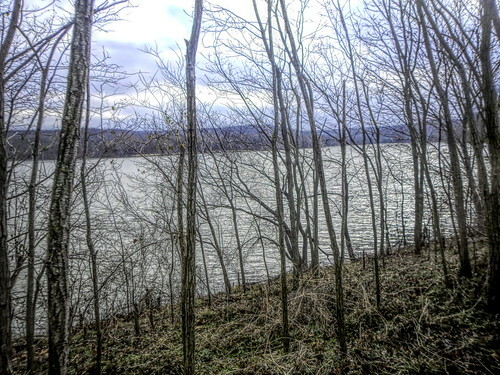 It has the best views, it also had a little bit of wind compared to the more secluded areas. I was bundled up pretty good though. I’ve got a lot of excellent cold weather gear that I have accumulated over the years. There were not very many people. 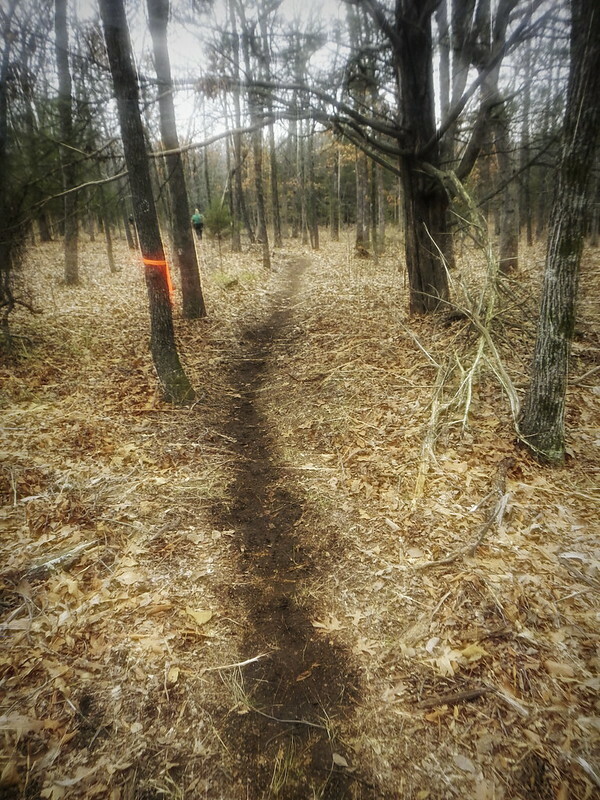 I saw one or two trail runners, several couples hiking, and only a few mountain bikers. 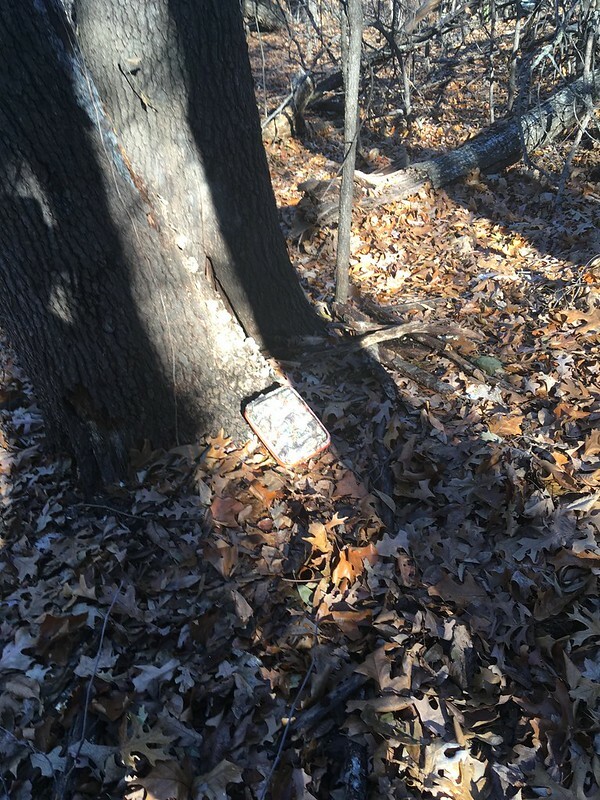 I ended up with about five and a half miles and looked for two caches and found one. 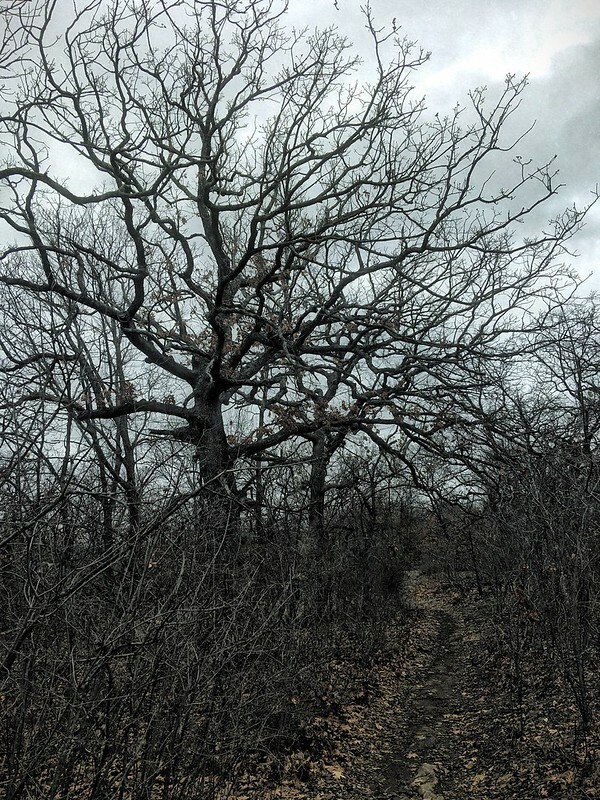 I have found almost all the geocaches on Turkey Mountain that don’t require climbing equipment or a ladder to reach. I used to try and get those on my own but as I have got older I realize that gravity is not necessarily my friend. 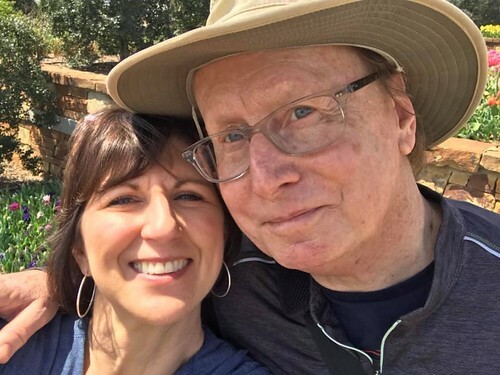 This entry was posted in Uncategorized and tagged New Years Day, Our World Tuesday on January 6, 2019 by Alan Bates. 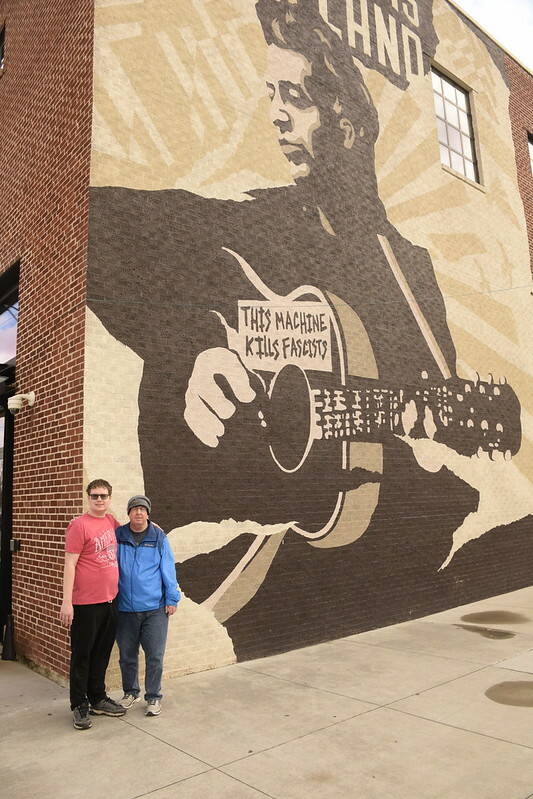 Right after Christmas me, son Logan and brother Bob visited the Woody Guthrie Center in downtown Tulsa. 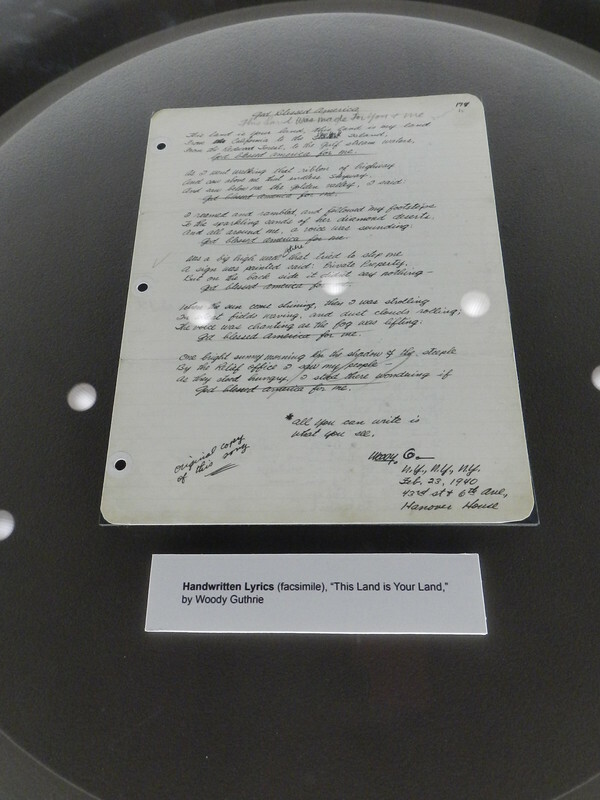 The center is the archive for almost everything Woody Guthrie and they have a small museum showing off some of his papers, musical instruments, artwork, and of course his music. 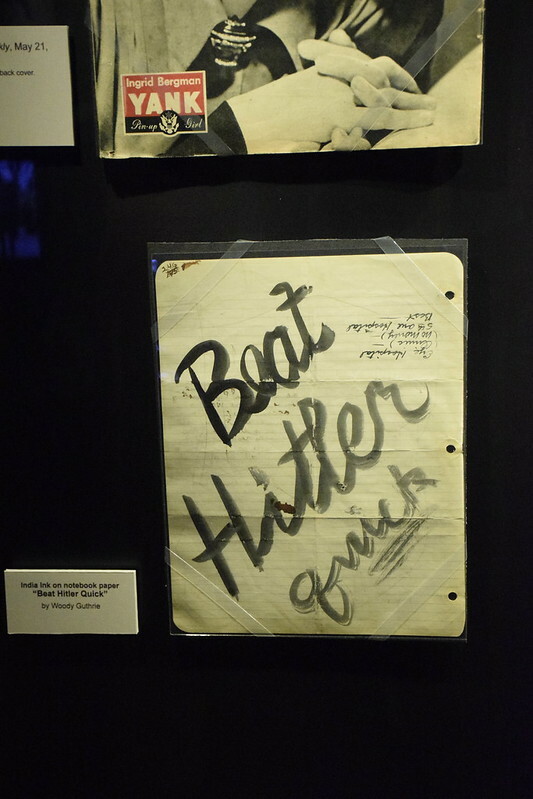 They have on display lots of his papers with lyrics and notes, letters and such. He wrote on all sorts of materials. You can tell he hated fascism. One interesting segment is that he lived in an apartment owned by Donald Trump’s father, Fred Trump in New York. Woody didn’t really care for what he considered racist housing policy. The museum also has a Virtual Reality experience of the dust bowl that is very eerie. 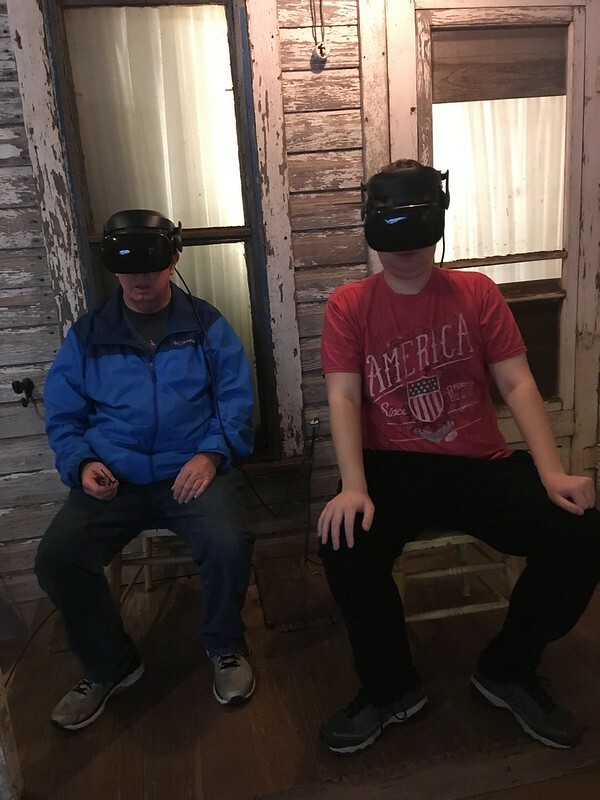 Here are brother Bob and son Logan with the VR goggles. 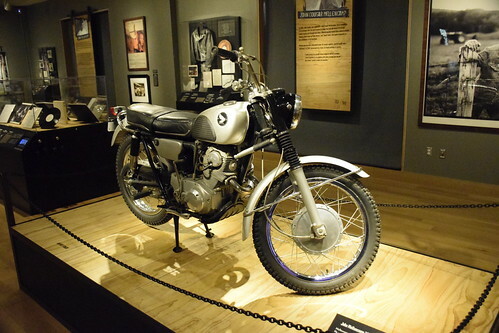 The center also has a small space for special exhibits. This time they had a lot of memorabilia from John Cougar Mellencamp including recordings of his songs and quite a bit of material of Mellencamp talking about his music. I found it quite interesting. 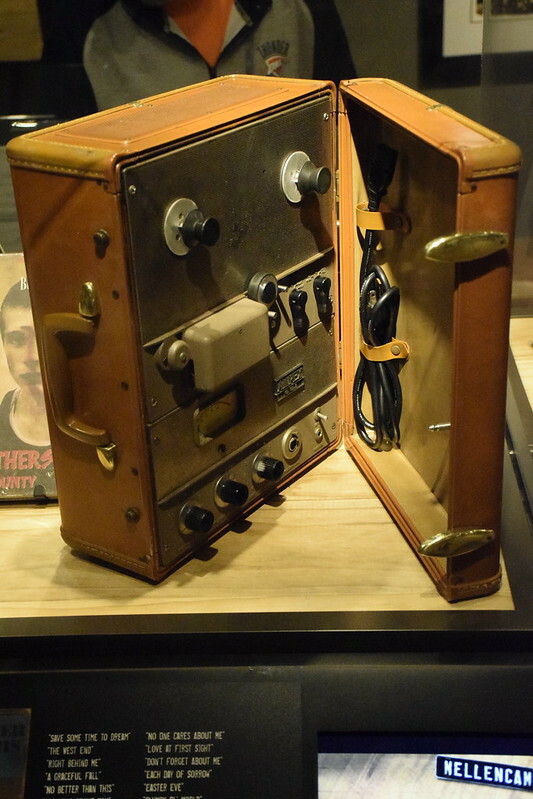 As part of the Mellencamp exhibit was this reel to reel recorder/player. I tried to explain to my son how cool these things were and how expensive they were and then to why a ipod touch like mine totally outclasses these things. Reel to reel tape machines are still very cool in my book!! 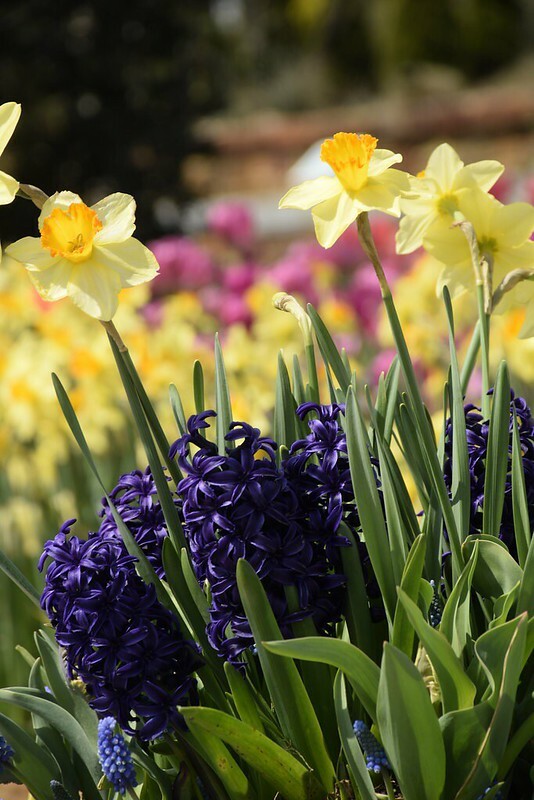 Check the centers web site for information on hours, location, and exhibits coming up. They have an exhibit on Leonard Bernstein coming up in January. I’ll be checking it out. I got to see Bernstein at the premiere of one of his operas in Houston back in the 80’s. Everybody in the crowd was yelling “Bernie” like they knew him or something. 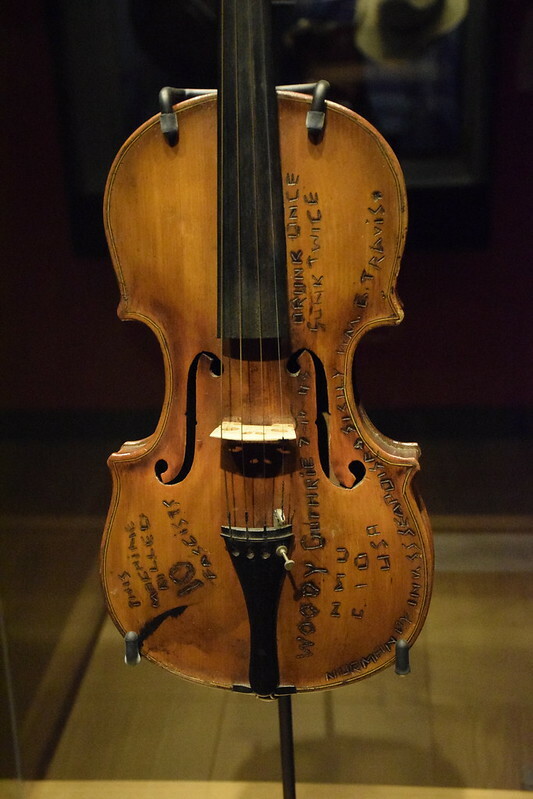 This entry was posted in Uncategorized and tagged Oklahoma, Our World Tuesday, Woody Guthrie on December 29, 2018 by Alan Bates. 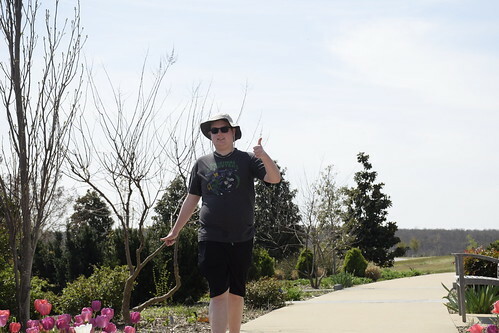 We are having some great weather right now. 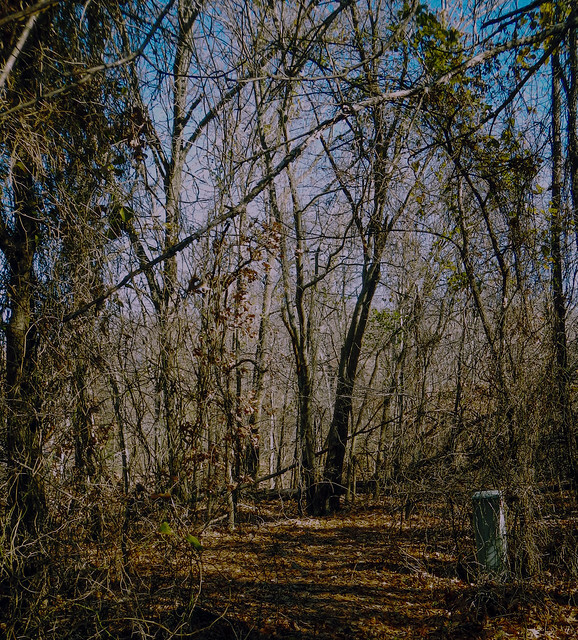 Sunny, almost warm, so Logan and I went exploring on Saturday in some urban woods. They are not a park, it is undeveloped private land. We were geocaching. Their used to be houses here I think. Note the phone box out in the middle of nowhere. I found the first stage of a multistage cache. The clue to the next location was a underlined letters in a Hardy Boys detective novel. Logan had to wait while I went through the novel and copied down the underlined words into my note book. 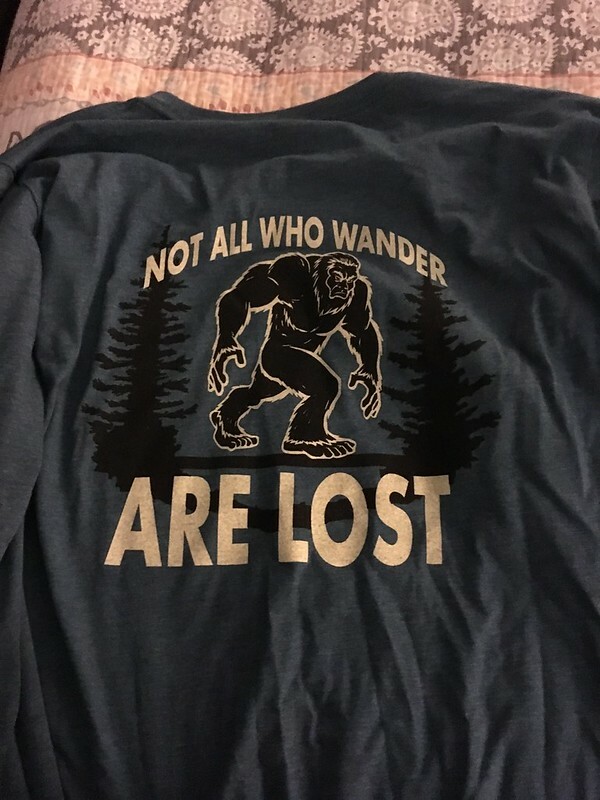 The letters told a riddle that I think I have solved except you know the answer is a word and I need a bunch of numbers because I am looking for GPS coordinates! We set that issue aside and went looking for another cache and found it. It Is a lot fancier than most of the caches we find. Some geocachers really put a lot of work into their hides. So we only found one, but the fun is in the looking, at least for me. For Logan, the fun is getting back home. This entry was posted in Uncategorized and tagged Our World Tuesday on December 16, 2018 by Alan Bates. Have you ever seen a cabin shingled in tshirts? Neither have I until now. 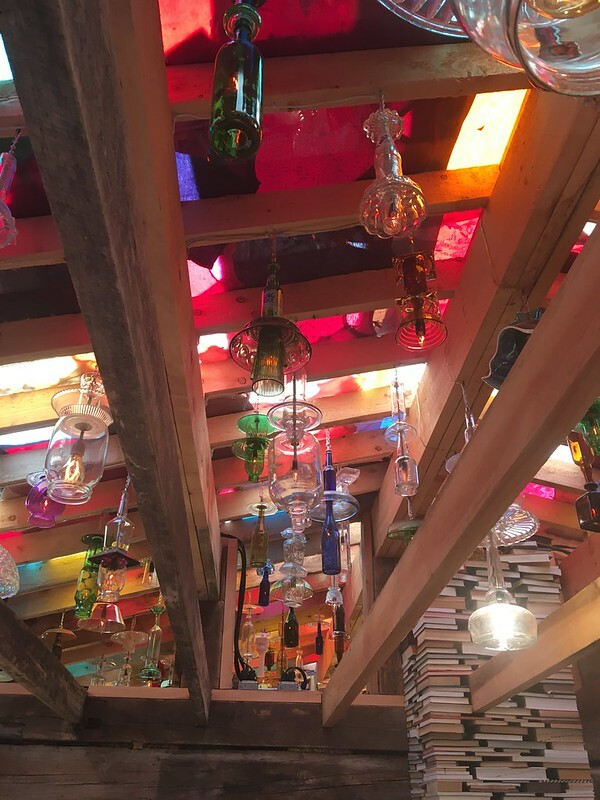 I suscribe to Philbrook Museum‘s instagram feed and for weeks they have been posting images of a new “Installation” in the gardens at Philbrook of a 19th century cabin shingled with plasticized clothes and a fireplace made out of books. So I have been muttering to myself this whole time, “What are they up to now??? 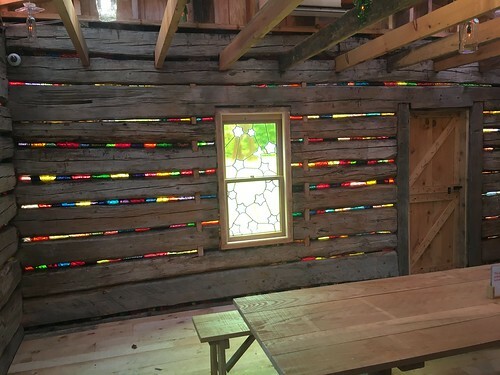 a cabin shingled with t shirts?? ?” Them crazy artist types at it again. Have I ever told you that I love stained glass? Well I do. So I ventured over there last week. We have a family membership thanks to Nana, the world’s greatest MIL. So I can check on those artist types whenever I want. Genius move, turning the page side out on the books. Plus, just so you know, that it is a fake fire. And yep, it is true. 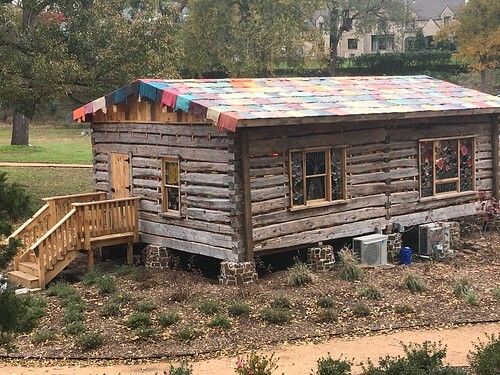 Philbrook has built a cabin out in the back 40 of their acreage and it has plastisized tshirts for shingles on the roof, and chinking in the logs, along with some LED lights. 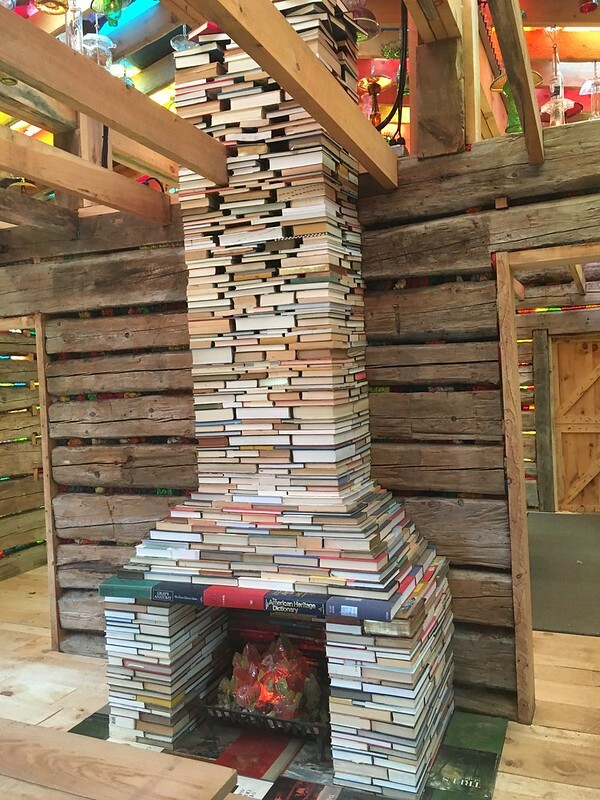 And a fireplace made out of books. I love the impression of light coming through the walls. And they have some beautiful stained glass windows and some great many lights in the ceiling made out of found glass. And you know what it all works. It was a dark, overcast day outside but inside it was bright and sunny and just plain wonderful. My iphone pics do not do it justice. It was a very bright happy place. Light was coming in everywhere but the floor!! 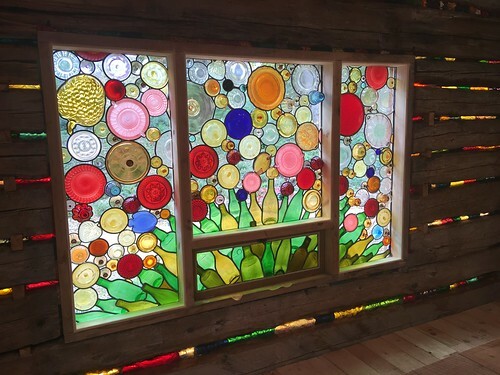 The artist behind all this is Karl Unnasch, who specializes in stained glass and all things considered with light. This whole”Installation” thing is something new to me and it seems that Philbrook is doing more of these. They seem to be temporary and not meant to last forever and you know somehow it works for me. So I guess that I approve of this cabin and what the artist types are up to. 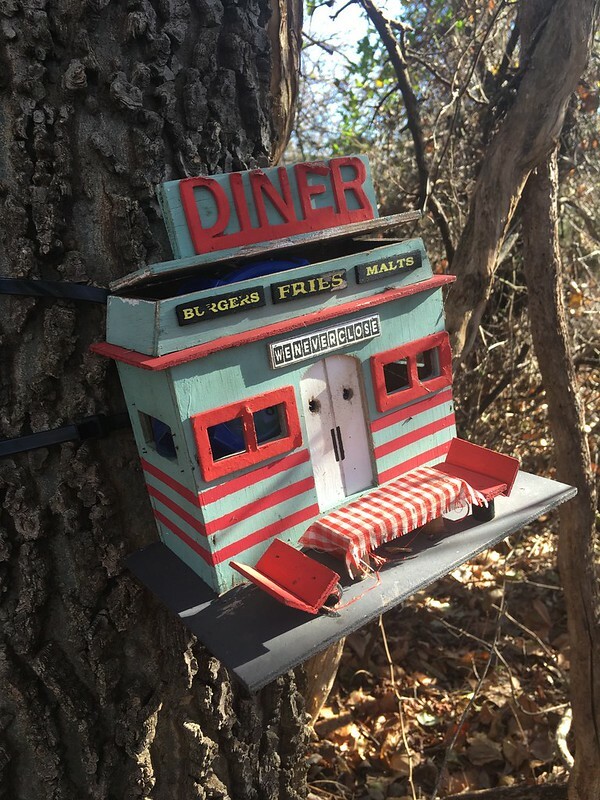 This installation is called “Slumgullion (The Venerate Outpost)” If you know what that means, please let us know. Or at least let me know since everybody but me seems to think it makes perfect sense. I love the soft colors filtering through the plastisized tshirts and the found glass lights in the ceiling. 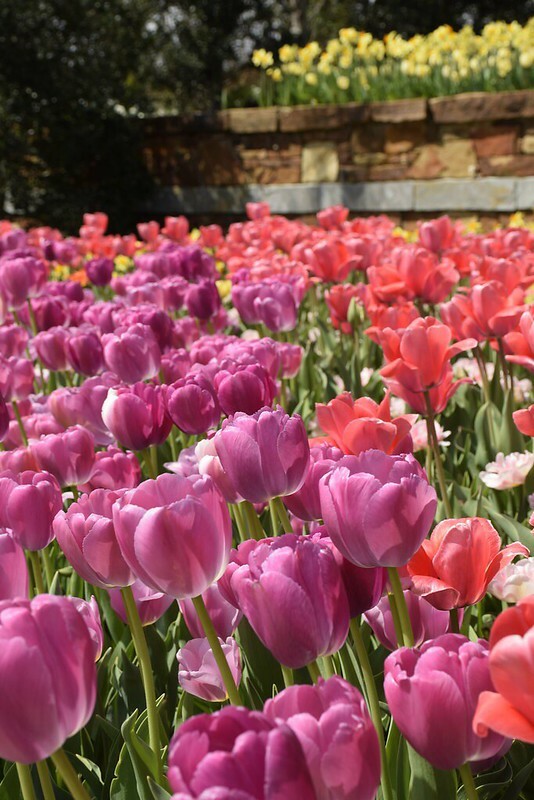 Check out Philbrook’s web site. They got all sorts of info on hours and what they are doing, which is considerable. You know they have two sites now, right? It I am linking with Our World Tuesday. 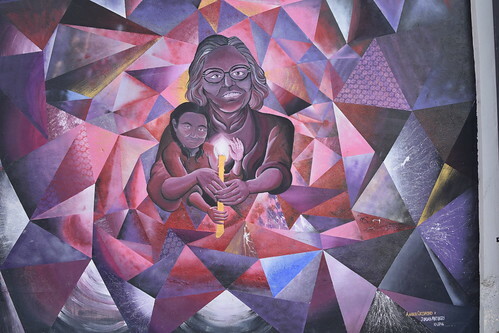 This entry was posted in Uncategorized and tagged Art, Oklahoma, Our World Tuesday, Philbrook Museum of Art on November 11, 2018 by Alan Bates. Skulls and skeletons are significant symbols of both the dead and the living. Underneath we are all skeletons. Heather and I ventured to Living Arts of Tulsa Friday evening for their Day of the Dead event. National Geographic has some information on the Day of the Dead. First off it is not a Mexican version of Halloween. 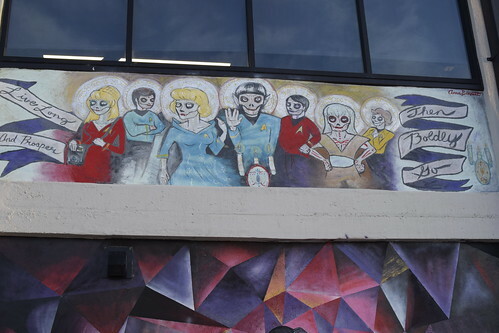 I loved this Star Trek themed Day of the Dead mural. They claim that it originated thousands of years ago when the Aztecs and other ancient cultures. They believed that death was on the same continuum as life and that their ancestors should be honored. 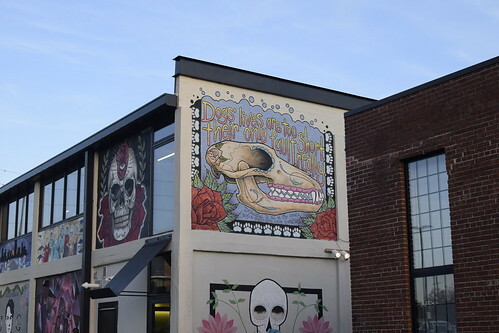 This mural is for those of us who love our pets. They just do not live very long. 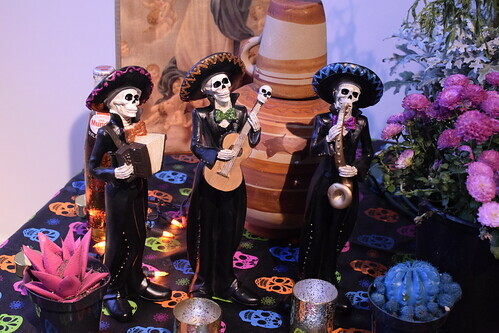 Over time the ancient traditions merged with Christian beliefs and now the Day of the Dead occurs November 1 and 2, All Souls Day and All Saints Day. 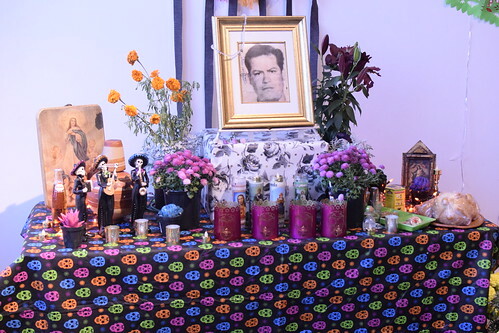 A big part of the Day are the ofrenda’s or altars to the dead that can be installed in homes or graveyards. They are meant to honor the dead and make them part of the holiday. Photos and other rembrances are displayed and favorite food and drink is offered. 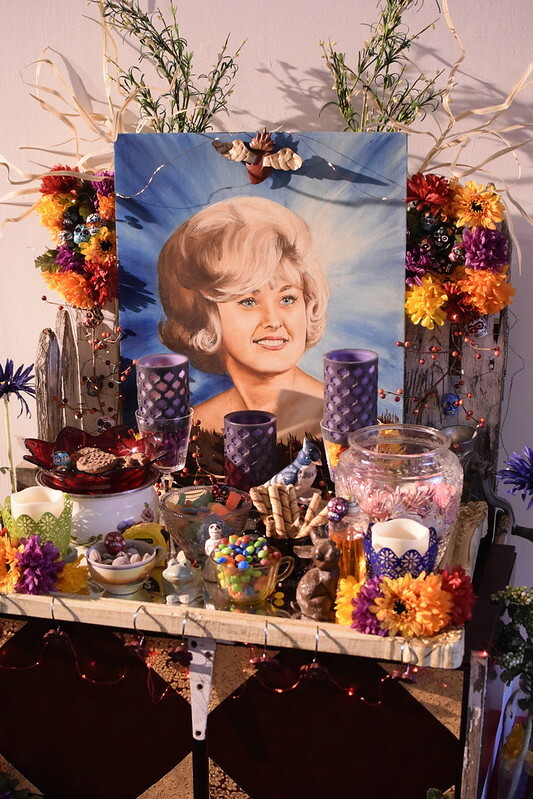 The Ofrendas at Living Arts are for real. They are built by people for their loved ones. 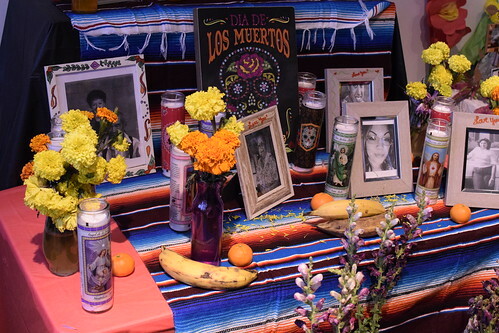 They are really powerful and they speak to me of the power of family, love, tradition, remembrance and mourning. 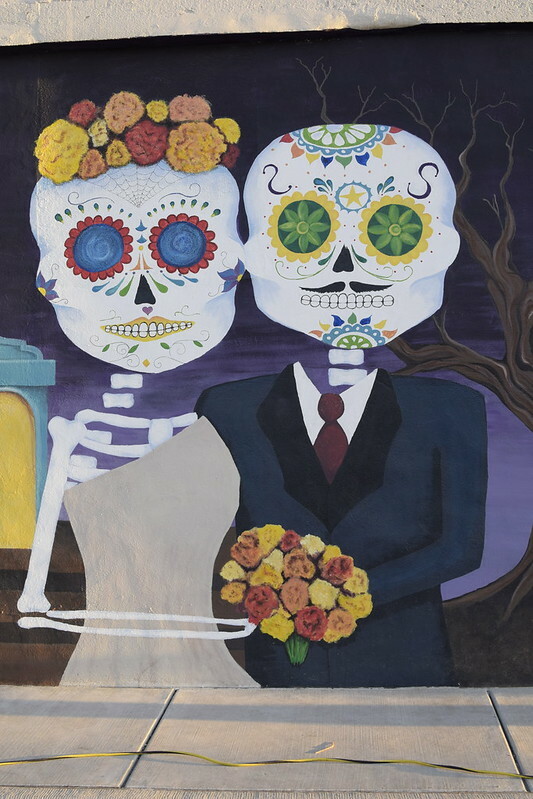 This entry was posted in Uncategorized and tagged Art, Day of the Dead, Living Arts, Mexican Culture, Murals, Ofrendas, Our World Tuesday on November 3, 2018 by Alan Bates. 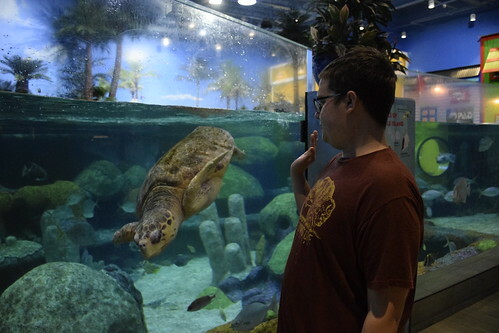 Logan and the Sea Turtle wave at each other. My employer helped pay for this exhibit. Once a month during Heather’s Book Group meetings, Logan and I have “Boys Night Out.” Recently we checked out the Oklahoma Aquarium in the Tulsa suburb of Jenks. 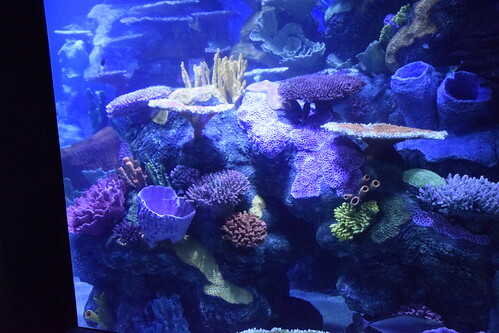 They recently opened up the Polynesian Reef Exhibit. It’s beautiful. The exhibit looks better than I photographed it. 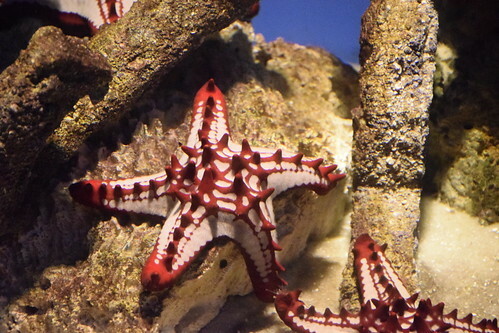 I love this colorful Red Spined Starfish. 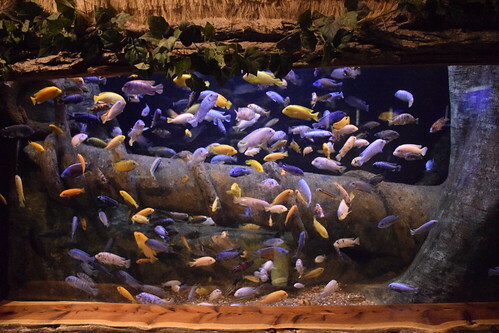 The African Cichlids have been there a while. I love the colors and the random patterns. If you are an Oklahoma fisherman, these striped bass are the ultimate in Oklahoma. They are huge. We had a good time. 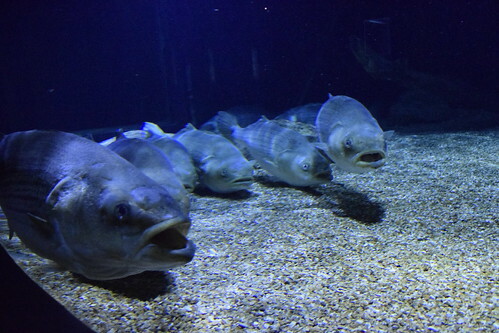 Check the Aquarium’s Website for information to plan your visit. They are open late on Tuesdays which makes it very handy for Boys Night Out! 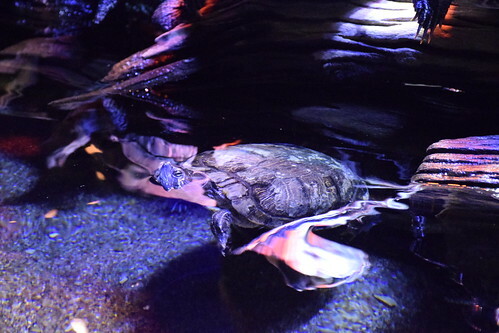 This entry was posted in Camera Critters, Our World Tuesday and tagged Aquariums, Boys Night Out, Camera Critters, Logan, Oklahoma Aquarium, Our World Tuesday on October 6, 2018 by Alan Bates. 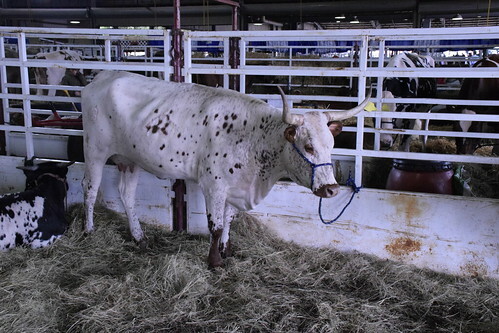 Last Saturday I went to the Tulsa State Fair. I love the Fair, I try and go every year. I love the sights and sounds , and the people and all the colors. 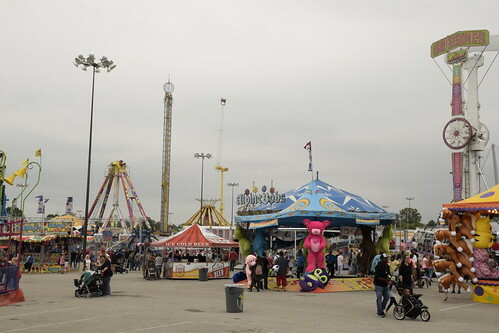 I got there kind of early so the midway wasn’t very busy yet. Don’t you love it. 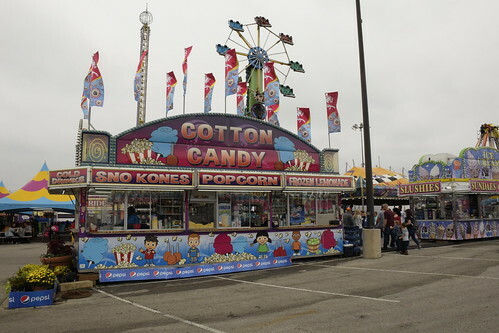 I wouldn’t touch cotton candy with a ten foot pole. I haven’t had any since I was a kid. I am kind of a sensory guy and the texture totally creeps me out. Plus, too danged sweet. Photos, I take my own photos, thank you very much. 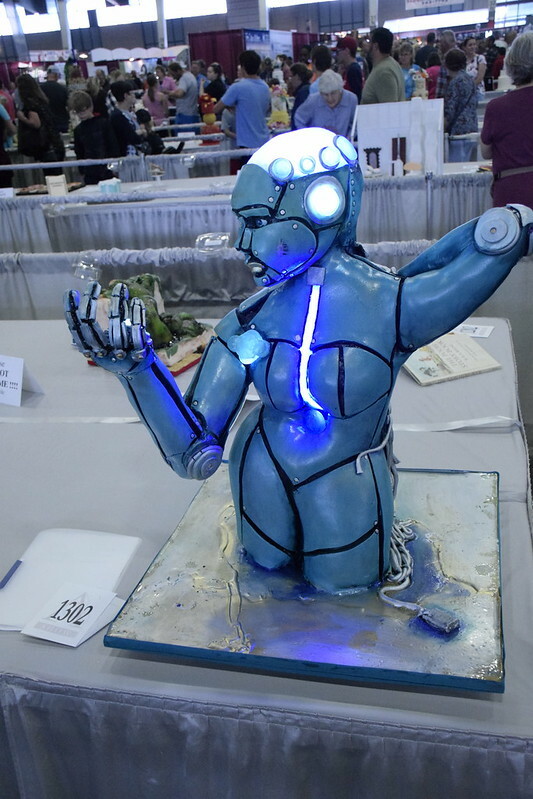 I checked out the Oklahoma State Sugar Art Show. I did a separate blog post on it yesterday. I love all the cakes! I spent the most time there. Then I went to the far eastern end where the crafts were. 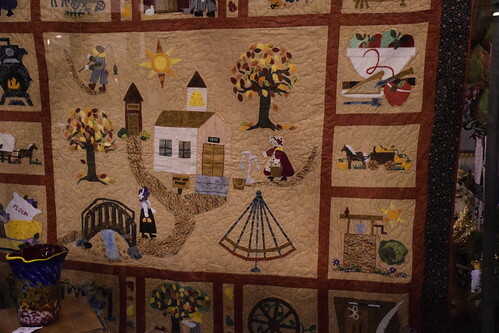 I love the quilts. There were lots of quilts there. Very nice. 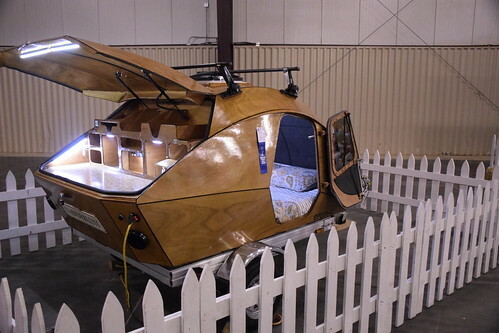 This little teardrop trailer was a winner in a woodworking classification. Isn’t it gorgeous. These little trailers are very popular in geocaching campouts. I’ve always wondered about the practicality of these things. Like I am 63 years old and there is no way that I could change clothes in this thing. They are cool to look at though. 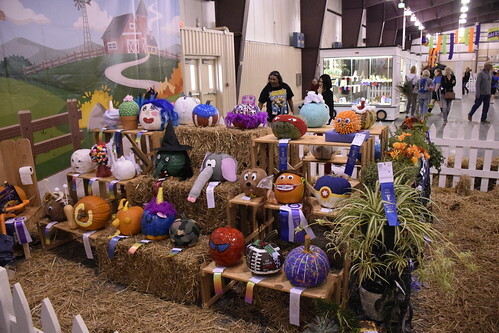 Pumpkins, lots of decorated pumpkins. 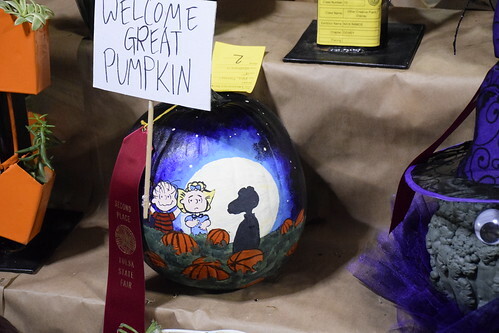 I love decorated pumpkins. 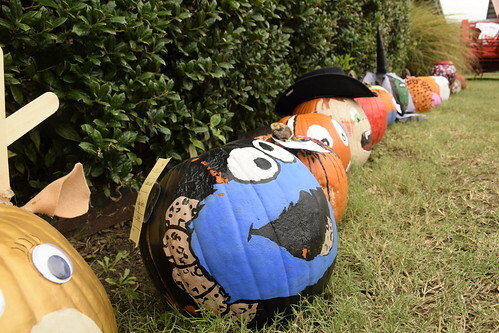 There were no Trump pumpkins this year, that I saw unlike previous years. Maybe they don’t allow them. 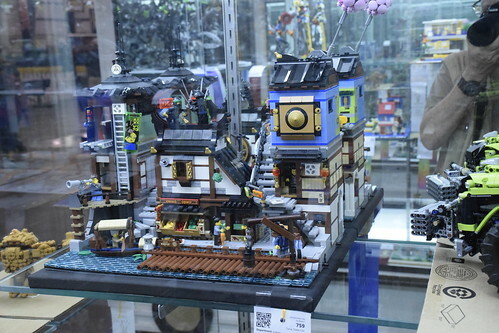 They had a lego competition. Lots of great entries. I moved over the adjoining building where they had the birthing center (for critters not humans, just so you know, although they could probably handle that too, that would give them little kids an education don’t you know!) and the petting zoo. I didn’t go to either one of those. 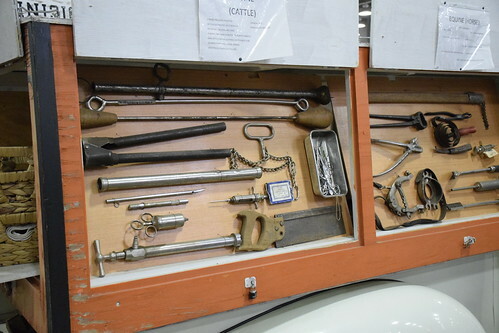 I took one look of vintage veterinarian tools and I saw all I needed to see. 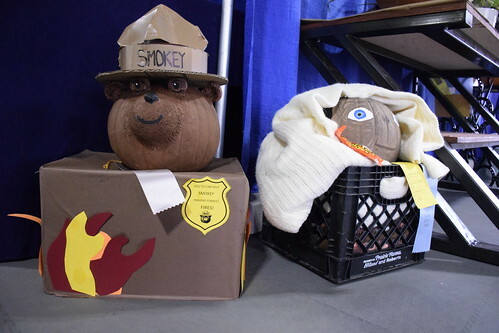 They had a Smokey Bear pumpkin inside. 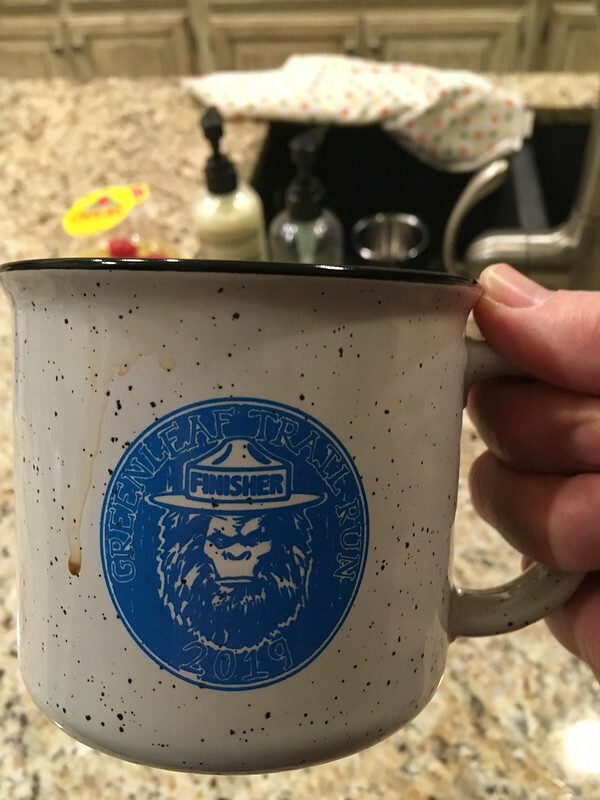 As a Forest Ranger’s kid I am always into anything Smokey Bear. 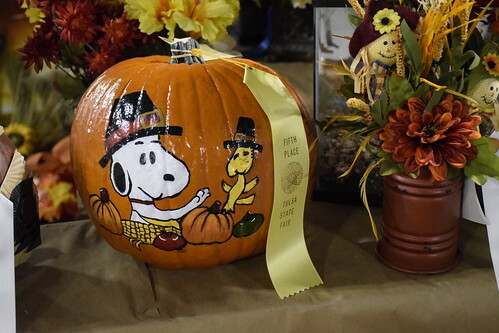 There were lots of Snoopy themed pumpkins. This is my favorite. No Trumpkins inside though. 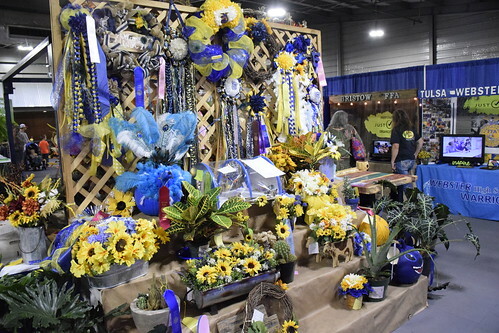 The various FFA chapters have table displays and I love looking at those. Lots of work and creativity involved. This is for the Oolagah, Oklahoma Chapter. 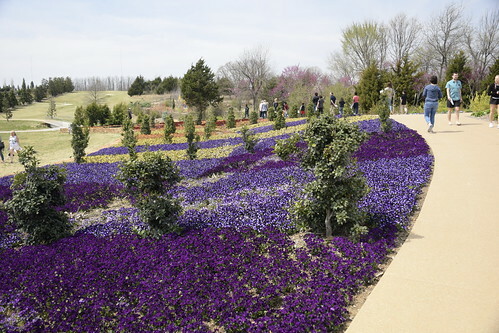 Oolagah is a town about an hour north of Tulsa, near where Will Rogers grew up. 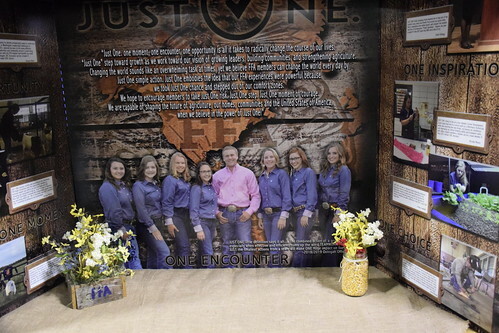 I loved the photo in this display. All those pretty young women and the guy, dressed in pink. Obviously confident himself and smart enough to hang out with women. I have always preferred the company of women, myself. Kudos the guy, whoever he is. I salute you. And whoever had the genius idea of inverting the expected colors. Nice. 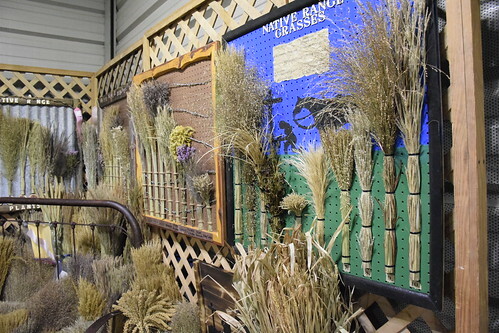 Displays on native grasses in Oklahoma. 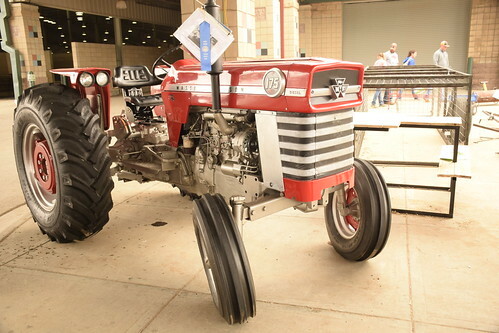 And this was an FFA project, to restore this beautiful Massey-Ferguson tractor. And then on to the critters. 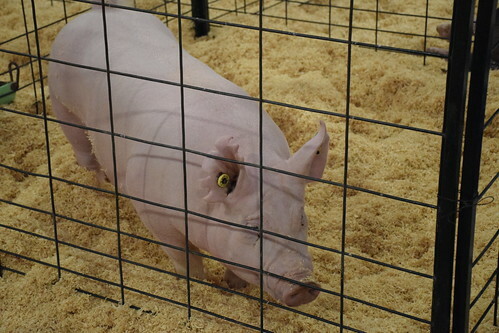 I swear the pigs were making eye contact looking for a friendly face. And the cows. 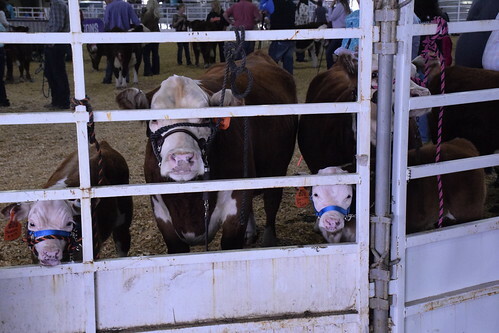 These are Herefords. 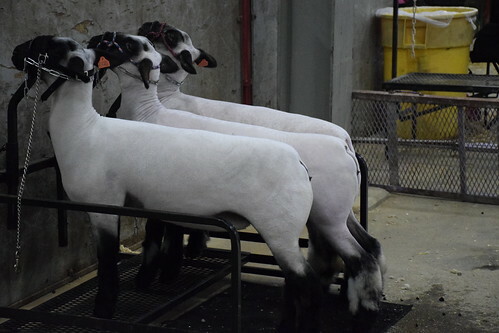 What my Dad called white faces. You don’t see too many of them these days. 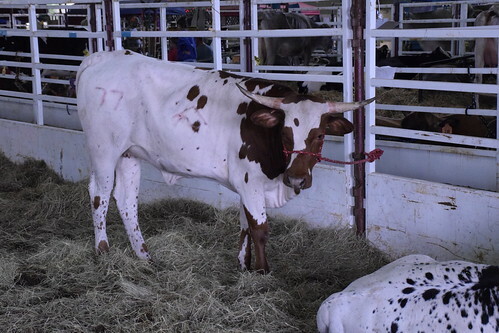 The longhorns are always impressive. 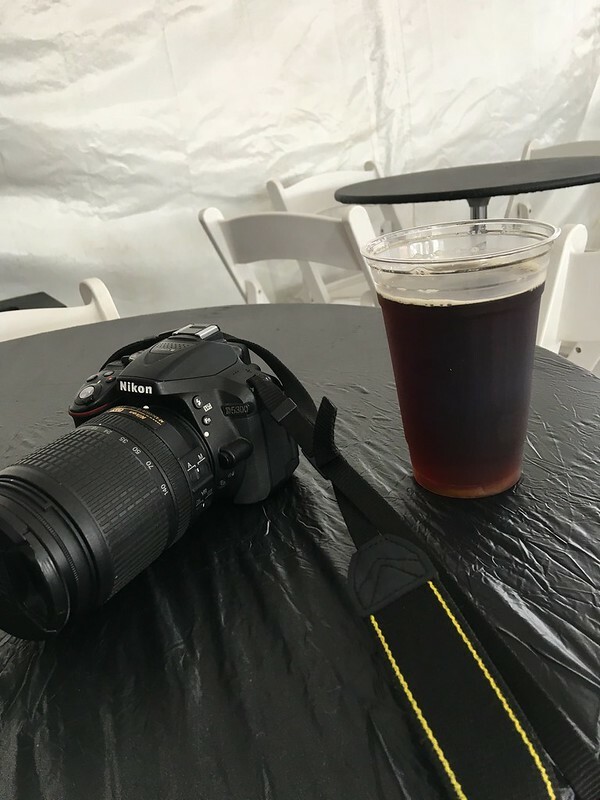 I finished up and rested up with a Spaten Optimator at the Beer Garden. 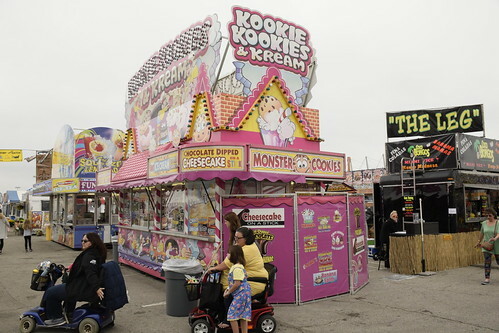 That and a corn dog was the only thing I paid for at the Fair (except for the $6 entry fee, and a $1 tip to the shuttle bus drivers, and a corn dog.) So, I’ll be back next year! 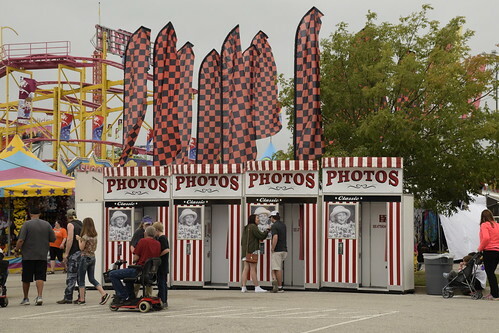 This entry was posted in Uncategorized and tagged Our World Tuesday, Tulsa Sate Fair, Tulsa State Fair on September 30, 2018 by Alan Bates. 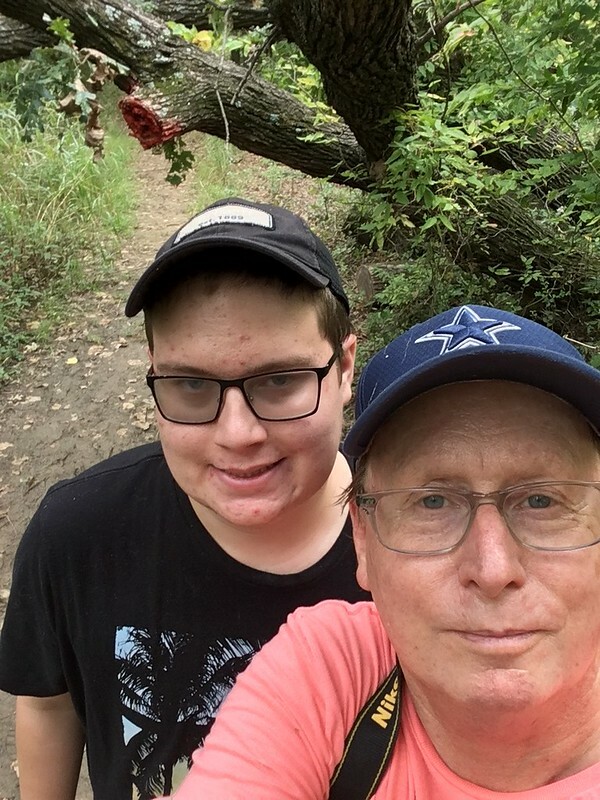 Logan and I decided to go on a hike today. 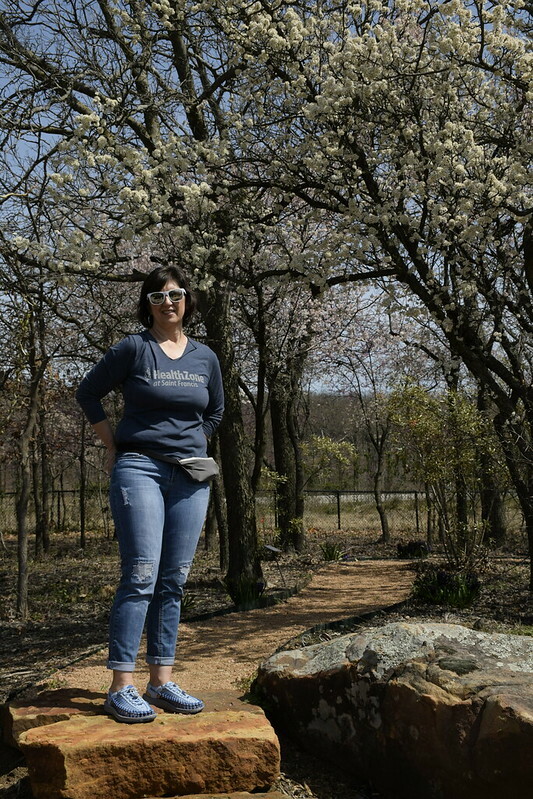 We went to Tulsa’s Oxley Nature Center up north of the airport. 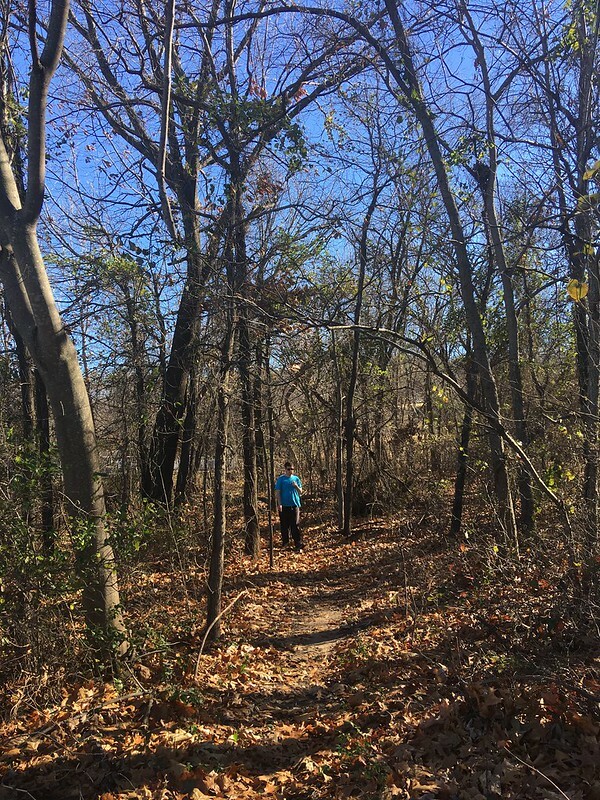 We decided to do the little used North Woods Loop, away from the main Oxley Nature Center. 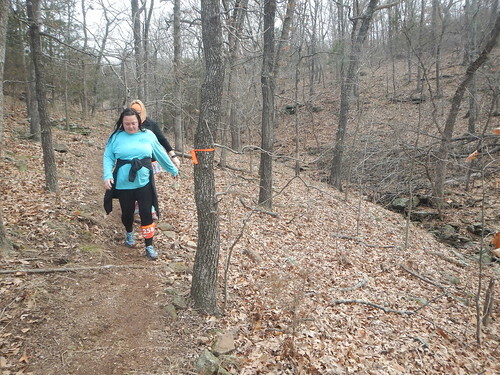 We may have been the first people to use the trail on Sunday. How would I know? Because we were walking through lots of spider webs. That honor traditionally goes to the early morning hikers and runners. It is not that pleasant but on Sunday we were walking through webs at four in the afternoon! Went on the Sierra Club trail. 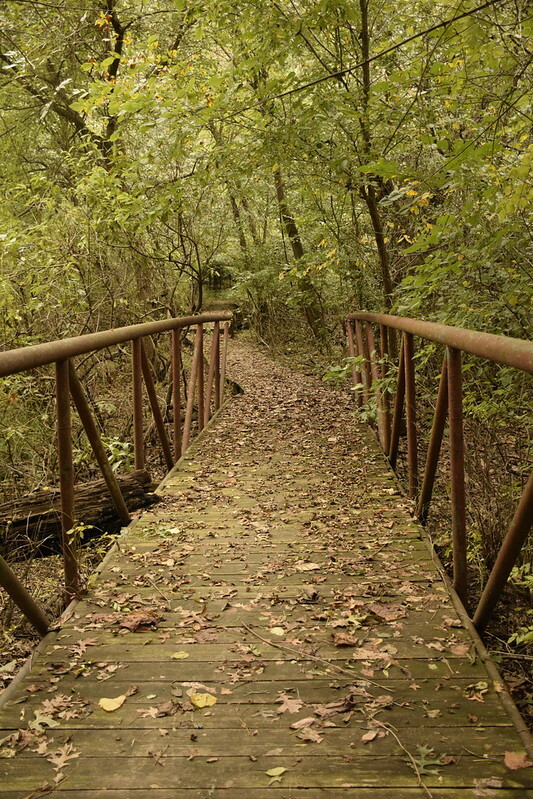 It has my favorite walkway. 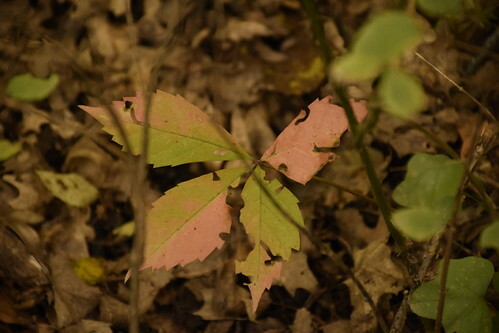 We saw the beginnings of Fall Color. We’ll be checking back. 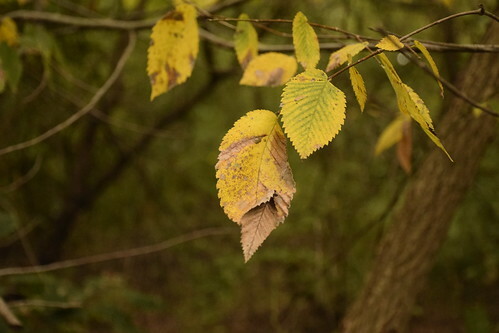 More beginnings of Fall Color. 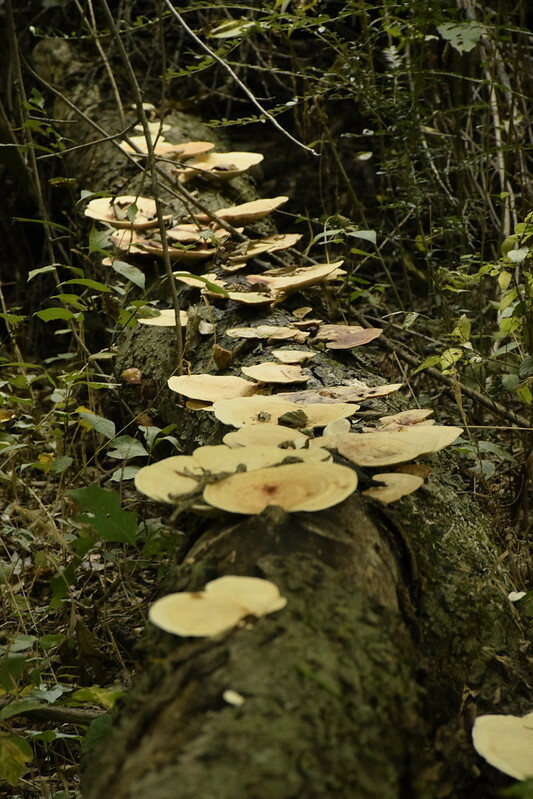 And more and more fungus. We only went a little more than two miles but didn’t see anybody. We saw lots of squirrels and cardinals and a glimpse of a few white tailed deer as the scampered through the woods away from us. We were only out for a couple miles and it was nice not seeing anybody. 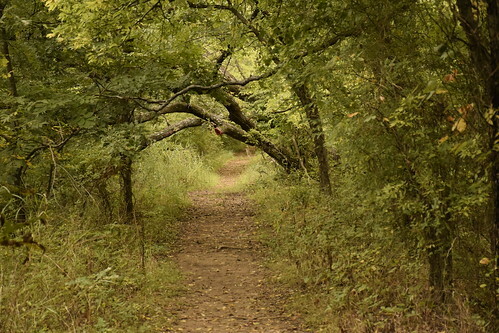 Or hearing anybody, except the squirrels in the brush, the deer in the thickets, and the wind in the tops of the trees. 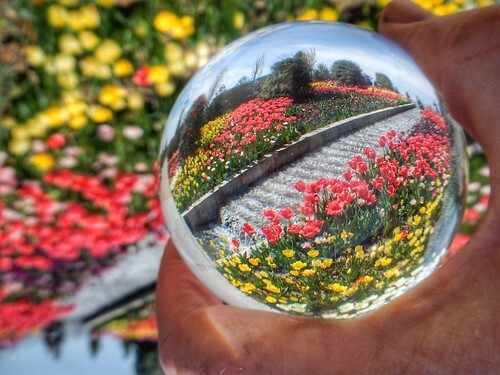 I am linking with Our World Tuesday. 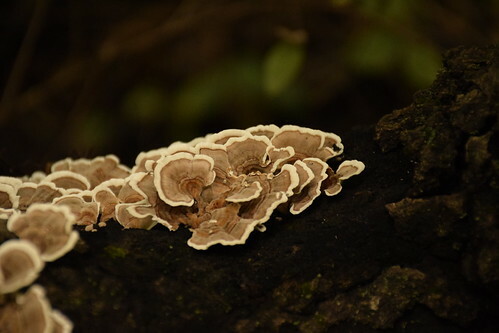 This entry was posted in Uncategorized and tagged Hiking Logan, Our World Tuesday, Oxley Nature Center on September 23, 2018 by Alan Bates.